I probably would have just left this as a review on IMDB but as it turns out there is a word limit on that site which means that I can't actually say everything that I want to say about, well, this movie. Actually, I have to admit that as a website IMDB is pretty ordinary - it's good for finding out about movies, and I do have a habit of writing a review of every movie that I have seen, but that is about it - unlike Goodreads it isn't a website where you can discuss movies with people or actually write engaging posts on a particular movie. Actually, they did have some discussion boards but have since decided to can them, which is a real shame. 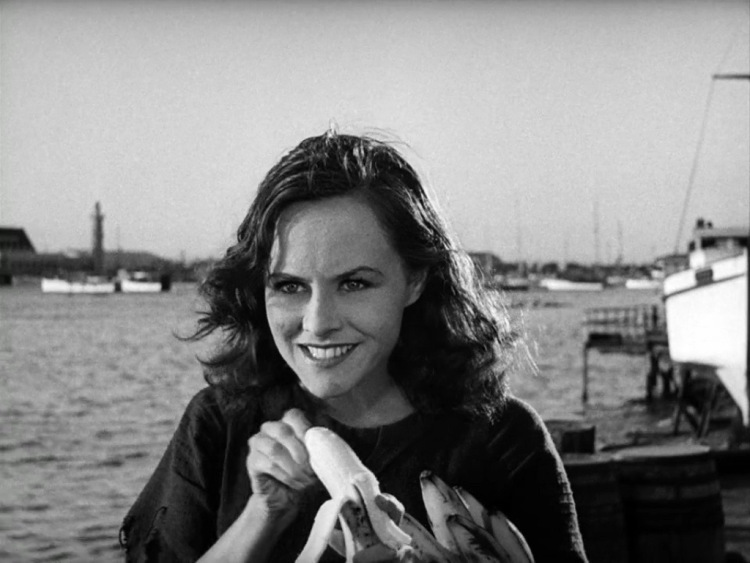 Anyway, when I wrote my post on Charlie Chaplin's Modern Times it ended up that I had to cut the post down by something like a half (or not that much, but I did have to cut it), which I have to admit was really annoying. However, since IMDB's reviewing systems really only allows for short, and simple, reviews, I decided that I should probably write about it as a blog post, particularly since it means that I can actually write an awful lot more about this movie than I could previously, and am also not limited by it having to basically be a review. 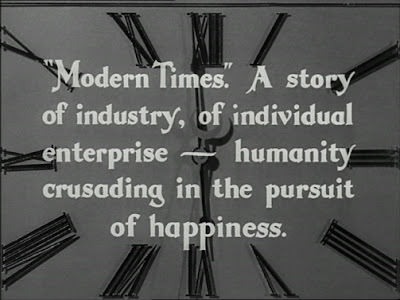 Mind you, why anybody would actually need to review Modern Times is beyond me because the film is a classic, yet I guess I just have this habit where I have to put my thoughts down on paper. I have to be honest as admit that this is actually the first Charlie Chaplin movie that I have ever seen. Well, it seems that he didn't actually make all that many full length films, namely because he was one of the very first Hollywood stars (or should I say super-stars), and was working around the time that the film industry was still very much in its infancy. This was a time when there was limited special effects and stunt men basically did stupid things and got hurt as opposed to using fancy camera angles to get the effect that they wanted. In fact Chaplin, being one of the pioneers of film-making, and even established one of the original film studios - United Artists. I'm not really all that sure if we can say that Modern Times actually has a plot, namely because it seems to mostly be Chaplin moving from one situation to the next, and then the film ends. 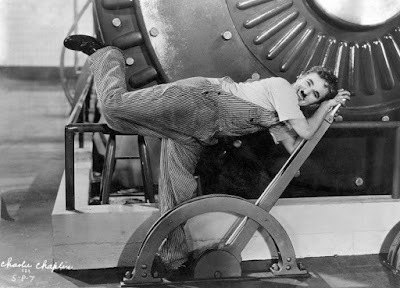 It is comedy, but the thing is that the comedy works on two different levels - in one sense it is slapstick, pure and simple, but then again Charlie Chaplin was the master of slapstick. However, on another level it is satire, and it is satire in the sense that as you are watching the film you might not even see it, but when you step back and think about it, you will then begin to see what is actually going on. In a way, what Chaplin is doing is taking us on a journey through the world as he sees it, and it is a world that in many ways has not changed in the eighty-odd years since the film was released. 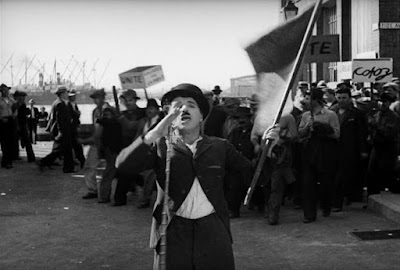 The interesting thing is that somebody suggested that Chaplin was not intentionally being political with this movie, though this person couldn't be further from the truth. Sure, he may have made such a comment back in the 20s, but this is certainly not the case now, and when you take into account The Great Dictator, and his later films, they certainly are political. In fact Chaplin ended up having to leave the United States due to suspected links with Russia, and since he had never taken US citizenship (he was a Brit), when the heat started coming from McCarthy and his crew he ended up moving over to Switzerland. Mind you, by this time the popularity that he had enjoyed in his younger years had long gone. Chaplin's most famous character is The Tramp, a character that we are pretty much all familiar with. 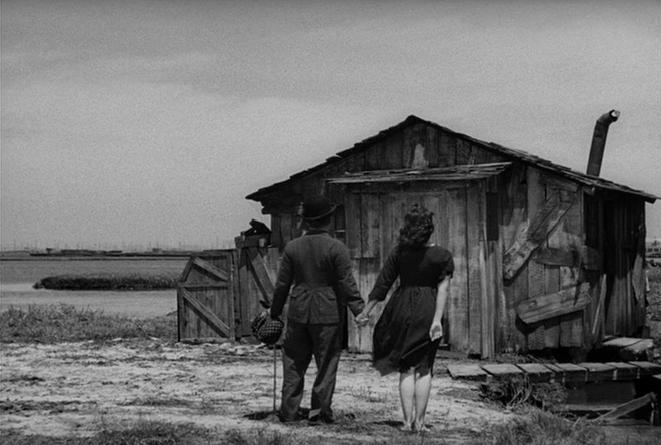 The interesting thing is that the Tramp appears in quite a lot of his films, and is literally his signature character. In fact, when you see him out of costume he is actually unrecognisable. 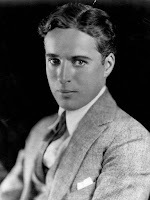 However, this character seems to reflect Chaplin's younger years in that he actually grew up in poverty, and it was only due to a lucky break that he not only entered the budding film industry, but rose to take the industry by storm. Mind you, with fame comes controversy, and it is interesting to note that Chaplin had a number of wives, some of them being the leading ladies (including Paula, who started opposite him in this film). Another interesting thing about Chaplin is that he was a perfectionist, but then again a lot of directors fall into this category - Hitchcock was another. However, Chaplin effectively took complete creative control over the film, being not only the actor, but the writer and the director as well. 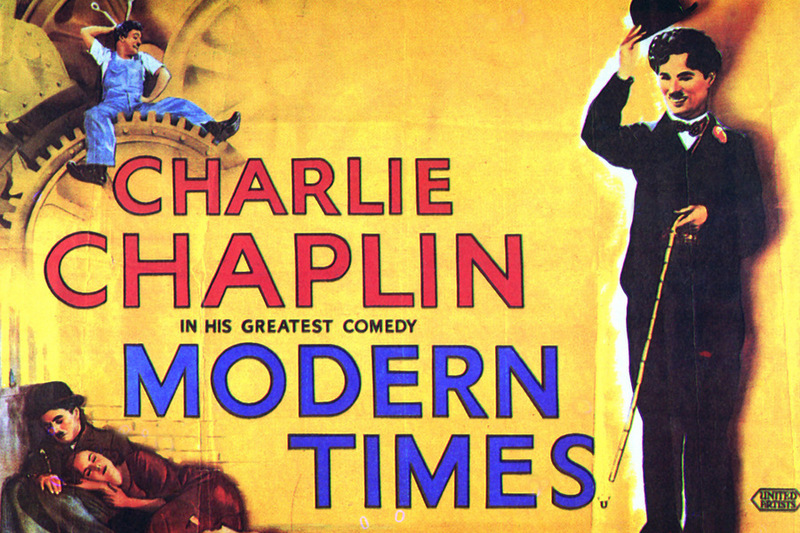 Finally, as I have mentioned, Chaplin is more than just slapstick, he is also quite satirical, and in many ways the jokes seem to sit with you long after the film has ended. 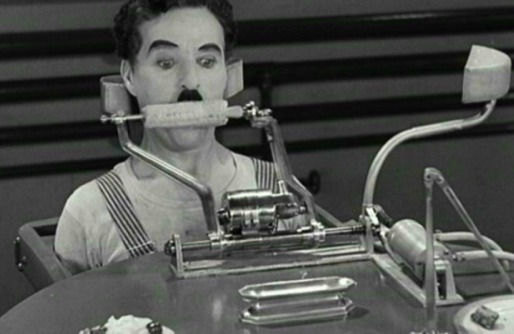 I also notice, rather interestingly, that even though by this time sound had been developed, Chaplin seemed to prefer to continue to use the silent style in his films. There a number of topics I wish to touch upon, and Modern Times does draw them out. The first is the idea of industrialisation and mechanisation and how it is destructive towards the human soul. The film begins in a factory and Charlie is on an assembly line tightening bolts. However the factory owner isn't happy because production isn't going fast enough, so he is looking for ways to speed it up. One method is by bringing in a device that is designed to feed the worker while they are working, so as to eliminate the need for a lunch break - however the machine doesn't work, and poor Charlie has to suffer through it. The other way is simply to speed things up, which eventually causes Charlie to have a nervous breakdown. It is interesting to see how these two ways are filtering into our workplace - digitalisation and computerisation is looking to make life easier for workers, but everytime a new system comes on line it ends up breaking down and causing no end of troubles. Mind you, they always press ahead with it. However, employers have always been looking at ways of getting the most out of their employees, whether it is clocking on and clocking off, or logging into your computers - the hours worked and the hours paid are measured to the second. Mind you, one of the main reasons that we have lunch breaks is that it is mandated by law. However, the other ways that employers look to increase value is to continue to raise the standards expected of the employees. In a way more work is expected from less employees - and the employees that are working are expected to maintain the high standards that are demanded of employers. In a way what we see in Chaplin's time is in many ways similar to what we are seeing now - the film is set during the Great Depression, and profits are scare, so companies end up looking for ways of increasing those profits by not only demanding more from workers, but also cutting back on costs so as to keep such costs down - having too many workers, even though they may make things easier during busy times, end up causing a drain on the profits, so employees are simply expected to put up with it during busy times because, well, you have a job so be grateful. Obviously Chaplin couldn't handle the pressure because everything eventually started to look like a bolt to be turned, and he started chasing people everywhere before collapsing and being carted off in an ambulance. Well, obviously he couldn't handle it, so that's his problem and not the employers, so he has effectively be hung out to dry. When Chaplin is released from hospital we find that he now takes on the persona of the tramp, namely he is unemployed in an era when unemployment is rife. However, the movie goes much deeper into the nature of poverty than simply being poor, because despite going hungry, to take food without paying is theft, and theft is a crime. One interesting thing though is that Chaplin seems to regularly land up in prison, even if he technically hasn't done anything wrong. For instance a red flag falls of the back of a truck, so he picks it up in an attempt to attract the truck driver's attention, however unbeknowst to him, a protest march materialises behind him, and he is then arrested and locked up for being a communist agitator. Let us also consider his girlfriend - she is doing what she can to try and get something to eat, however she doesn't actually have any money, so she resorts to theft. However, despite the need for food, theft is still theft and she lands up in gaol. The interesting thing is that Chaplin seems to prefer life in gaol - he is fed regularly, his life is regulated, and he doesn't go without, however after heroically (and rather accidentally), preventing a breakout he is set free, but he wants to go back, so he takes the blame for the theft of the bread - except that the witness steps forward, says he is innocent, and than the woman is actually the thief. In a way this is morality gone absolutely wrong - in fact it isn't morality, it is legalism. I remember working in a supermarket stacking shelves at night, and was told that the supermarket bosses are actually more concerned about employee theft than about shoplifters. In a way somebody stealing food for a starving family is considered a necesity, where as employee theft is in a sense an abuse of one's position. No wonder employers want to make an example of an employee thief. However, when a member of the public stole something from the food aisle then general consensus among the staff was basically to let him do it and to say nothing. So, I raise the question as to whether we would actually do anything if we saw somebody stealing a loaf of bread. Well, these days what actually happens is that the homeless and the poor dumpster dump - that is they break into the dumpsters out the back of the supermarkets where all of the food that exceeds the used-by date is thrown, and take that. However, in my mind, there is just something totally wrong with throwing away food - with so much poverty and starvation in the world the idea of throwing away food is, to me, an abomination. However, the other interesting thing is that the Christian Right gets so caught up with abortion that they will cite stats as to the number of fetus' murdered, but turn blind eye to the huge number of children that die due to not being able to have enough to eat. So the question that I raise is: how many capitalist countries have successfully lifted their entire population out of poverty? Well, the interesting thing is that the Union Movement doesn't get spared either. The thing with unions is that they theoretically, in a purely free market society, should be able to exist. Yet unions shouldn't have a monopoly on employment since that undermines the core principles of the free market. Personally, I think Unions have provided a lot of good things in society, but then again so have corporations. For instance, without unions we wouldn't have the eight hour day, sick pay, or annual leave, but then again without corporations we wouldn't have, well, luxuries that we could pretty much live without. Come to think of it, casuals don't get sick leave or holidays - it is either come to work or we find somebody else to do your job. Mind you, I live in Australia so we have laws in relation to employment, though if you are a casual, you still don't get sick days or holidays. However, you do get penalty rates, which basically means if you work more than your eight hours a day, and at times when people are home with their families, then you get paid more. Mind you, the employers want to get rid of that because, well, it makes them uncompetitive, but in my mind it is just because they want to make more money because they aren't happy with what they have. However, there is a nasty side of unions as well. A friend of mine told me once that he worked in an industry (the automotive industry) where the unions had such control that you didn't have to do anything unless the union gave you the go ahead, and your employer still had to pay you. I have also heard of unions picketing and bullying small businesses to force them to do things that the corporations don't need to do because, well, they are corporations and these crackpot small unions really have no power over them (and the union that does is basically in their pockets anyway). The thing with unions is that, like corporations, they have their place, and they have their benefits, however like corporations the power that they can wield can and does get abused. 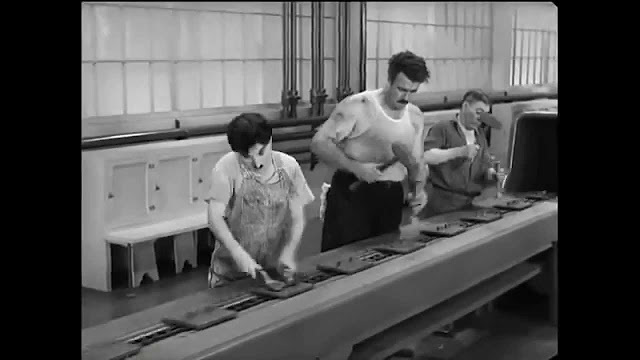 For instance, in the film Chaplin gets a job in the factory, but out of the blue the union comes along and calls a strike, and the thing is that because you work in the factory you are a member of the union, and if you are a member of the union, well, the union pretty much dictates what you do. In fact in Australia the construction industry is pretty much controlled by the union - unless you are a member of the union you pretty much cannot get a job in the construction industry, and you cannot join the union unless you are working in the construction industry - it is a vicious cycle that keeps wages at an unrealistically high level, though the Australian Liberal Party, which is the right-wing party, has approved the developers to be able to import labour from China, which is a way to undercutting the power of the union. So, we now move onto the idea of the American dream, that is that through hard work one can achieve a good life and be happy. This idea of the dream is actually genius because it means that people in the United States don't see themselves as being oppressed but rather as temporarily embarrassed millionaires. As Chaplin says at the end, the dream is still true, despite the fact that they are wanted by the police, because this is America and the Amercian dream is always there, just over the horizon. Yet in many ways it is like the carrot and the stick - it is held out as a possibility, that anybody can become president, that the people of the nation are free to do what they want. Yet they aren't - if you have a criminal conviction you can't vote, at all, or at least until you receive a pardon from the President. Sure, Robert Downey Jnr received a pardon, but there are many, many other people out there that haven't. In fact the American system seems to have more people disenfranchised than say, Australia. In Australia it doesn't matter if you have a criminal record, you can still run for parliament and you can still vote. Mind you, you won't get an endorsement from the major parties, but there is nothing disqualifying you from running - unless you happen to be in prison, or have a trial pending. It is this dream that keeps people under control, and it doesn't matter if they have been wiped out due to business failures because you can always claim bankruptcy, pick yourself up, and try again. Mind you, that is all well and good if you are an entrepreneur, or a charismatic businessman, but not if you are just your typical labourer. Mind you there was a time when you could have an unskilled job and still earn a decent wage and be able to buy a home and enjoy the luxuries of society - yet sadly those days have long gone. When you hear stories of software engineers sleeping in their cars because the rent in the San Francisco bay area is so expensive then something is probably quite wrong. Yet the other nature of humanity is that if we are given something for free then we end up demanding so much more. I knew a guy that was on a disability pension and was provided housing by the government, yet he never saw that as a privilege, but as a right. In fact he even refused to pay the small amount of rent that he was asked to pay because he believed that the government owed him that house. Mind you, they decided to intervene and take control of his finances, but once again he threw a tantrum because, despite the fact that the government was giving the money to him, it was still his money and if he wanted to put it into the pokies then it was his right. Okay, while that may be an extreme case, it is still an example of our entitlement attitude - which is why the idea of working for the dream mentality does actually encourage people to be productive. 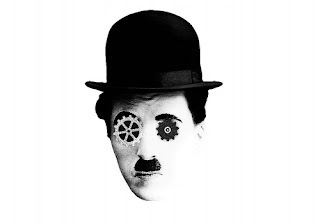 I was going to write a section on Charlie Chaplin's policies but I believe that I have covered much of that above. However, the interesting thing is his response to World War II, particularly with his support of Soviet Russia and his desire for the US to provide more support to them. Interestingly Theo La Sing, otherwise known as Dr Suess, also was agitating for the United States to enter the war because he saw the dangers that the Nazi regime posed. The scary thing is that while people may not necessarily consider themselves Nazis, there is still a rather nasty racist streak that runs through our society. Yet I still feel that we need to be careful not to confuse religion with race because I can see that ending really badly. However, I probably should mention that the left doesn't particularly like the attitudes of fundamentalist Islam's attitude towards women.